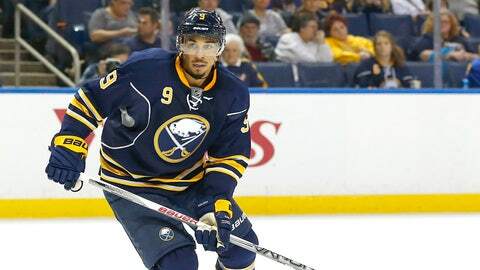 The Buffalo Sabres will be without one of their top scorers for at least a month. Evander Kane fell to the ice following a hit from New Jersey Devils defenseman David Schlemko, and he had to be helped off of the ice. Just two days after the injury, the Buffalo Sabres announced that Kane will be out for four to six weeks following a MCL injury. Kane, who has a goal and two assists in eight games this season, could be out until December with his injury. Kane is the third major blow the Sabres have taken in the injury department so far this season. In the season opener, they lost goaltender Robin Lehner to a high ankle sprain, and defenseman Zach Bogosian hasn't played in a single game due to a lower body injury. Coach Byslma says Evander Kane has an MCL injury; he'll be out 4-6 weeks.